Girls und Panzer has been adapted into an anime, which aired last fall in Japan and is currently streaming on Crunchyroll. Sentai Filmworks licensed the anime and will release it on home video in 2014. The anime has also spawned a theatrical animated film, which is set to debut in 2014. Each volume of Girls und Panzer: Little Army contains adorable artwork and includes colour inserts. This is the story of Miho Nishizumi in her elementary school days, taking place six years prior to the events in Girls und Panzer. Having been raised in a prestigious household that adheres strictly to the values of tankery, life isn’t easy for young Miho. With an older sister who has already risen to great heights, Miho has some very large shoes to fill. Together with a group of new friends, and a blossoming interest in tankery, Miho will set out on a road that may very well change her future. 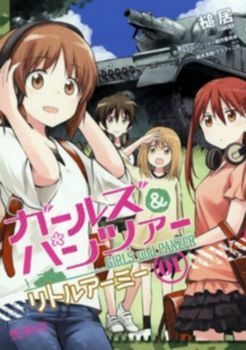 This is the conclusion to Girls und Panzer: Little Army, a two-volume prequel to dieselpunk-infused Girls und Panzer, which juxtaposes cute girls and their high school antics with dynamic tank battles and military tactics.